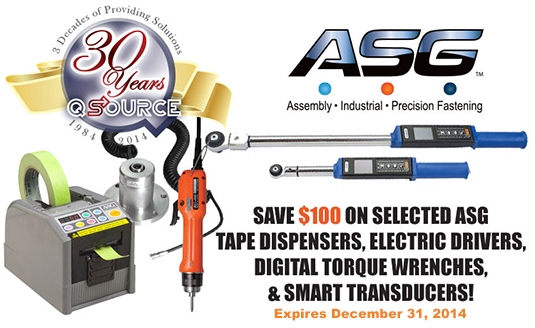 As a way of helping us celebrate our 30th anniversary, we're working with our long-time vendor-partner ASG to offer you an extra $100 off select ASG products at QSource.com. This limited-time promo requires no coupon codes and expires December 31, 2014. ASG BLG Brushless Electric Drivers – These compact, lightweight drivers are designed for medium-to-light torque applications and feature ASG's world class ultimate gold quality. Made with an anti-static plastic body, they offer the flexibility for small fasteners or vacuum pick-up applications. Visit the 30th Anniversary Promo page at QSource.com for the complete list of eligible ASG items. Prices displayed on QSource.com reflect the $100 discounted offer. Make your purchases online or send us your questions via our Contact Us page, phone (800-966-6020), or by email. Promo is valid thru the end of 2014.